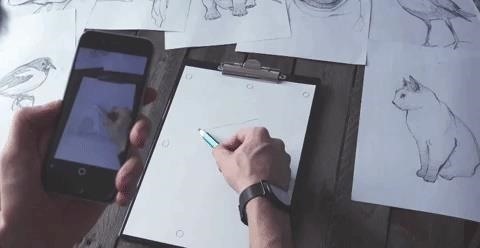 The user is given the option of drawing preloaded sketches or choosing a personal photo that will then be converted into an easily traceable image. To begin drawing, select a sketch and then aim the camera at the piece of paper you wish to draw on. The app will then prompt you to draw three circles — one at the top of the physical paper, one on the left, and one on the bottom. The camera detects your surface, aligns the circles, and will display the image you wish to draw. Then you can begin drawing, as shown below. Currently, the app only works on A4 paper, but that will soon set to change. When SketchAR becomes available on the Lenovo Phab 2 Pro with Project Tango, "it plans to use the phone's built-in sensors to detect its physical location." If you ask us, this definitely seems like a neat tool to use to decorate your walls. While this is not the first app to merge art and AR, it is the first that brings this technology to the iPhone, making it easily accessible, and usable, to a large consumer audience. SketchAR is currently available on iOS , and it will soon be available in the Google Play Store and for the HoloLens.